What Fire Extinguisher Do You Need? To safely put out a fire and minimize fire damage, it’s important to understand that there are different types of fire extinguishers designed to effectively douse different types of fires. There are five different classes of fires, each designated by a letter. Class A: The most common type of fire, Class A fires have combustibles that include paper, wood, cloth, plastic, trash and other ordinary materials that may be found in any home or business. Class B: Fires caused by flammable liquids are considered Class B fires. These flammable liquids include gasoline, paint and oil. A Class B fire may also include combustibles such as propane or butane, which are flammable gases. Class C: Electrical fires are Class C fires and include fires that originate from outlets, wires and other electrical components. Class D: Any fire caused by combustible metals such as magnesium, sodium, aluminum and potassium, also known as chemical fires, are Class D.
Class K: Combustibles such as cooking oils, grease and fats are Class K fires. It’s important to understand that no single fire extinguisher can safely and effectively douse every type of fire. OSHA states, “The three most common types of fire extinguishers are: air pressurized water, CO2 (carbon dioxide), and dry chemical.” There also are wet chemical fire extinguishers. The air pressurized water fire extinguisher or APW extinguisher is best for a Class A fire or one with combustibles that include items such as paper, wood, trash and other everyday items. 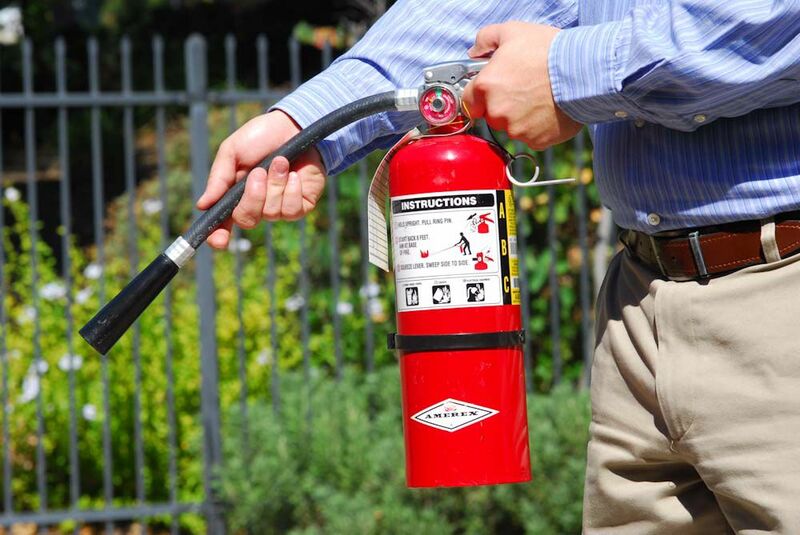 The APW fire extinguisher is filled with a mixture of water and pressurized air. Some also contain a detergent that creates a foam when activated. Every home and business should have this type of fire extinguisher handy. It’s typically an inexpensive type of fire extinguisher and is considered eco-friendly. Safety tip: Do not use an air pressurized water fire extinguisher on a Class B, C, or D fire as it actually can cause the flames to spread. A CO2 fire extinguisher is recommended for offices, computer labs, mechanical rooms and industrial spaces because it can be used safely around electronics and other similar equipment. Carbon dioxide, or CO2, is a non-flammable gas that can douse a fire by displacing the fire’s oxygen, which feeds the fire. Use a CO2 fire extinguisher to put out Class B and Class C fires only. The carbon dioxide fire extinguisher doesn’t leave behind any dangerous residue and is considered environmentally friendly. The dry chemical fire extinguishers douses the fire by “interrupting the chemical reaction of the fire triangle,” states FEMA. The multi-purpose dry chemical fire extinguisher, safe and effective for Class A, B and C fires, is one of the most widely used fire extinguishers. It’s ideal for homes, businesses, schools and hospitals. This unit uses ammonium phosphate as a dousing agent. The regular dry chemical fire extinguisher isn’t as versatile and only is effective for Class B and Class C fires. It uses sodium bicarbonate as a dousing agent. A regular dry chemical fire extinguisher can be used in kitchens, garages and laboratories. Designed to safely and effectively douse Class K fires, use the wet chemical fire extinguisher to douse deep fryer fires and grease fires in a kitchen or similar environment. It uses potassium acetate as its dousing agent. It’s an essential safety device that should be in every restaurant or commercial kitchen. Help protect your home and business by having the right fire extinguisher ready and available should a fire break out. If the unthinkable does happen and your home or business suffers a fire, let the professionals at King's Remodeling and Restoration be there for you to help get everything back to normal fast.